Managing your account and billing through InfoTrack is easy. Below are some key details that give an overview of how to keep your account up to date and make payments. Our finance team is available anytime you require assistance, simply email Finance@infotrack.com.au with any questions related to your account. The following are your account details. Please ensure these are correct and notify us as soon as possible if they are incorrect. If you would like to make any changes, now or in the future, please email Finance@infotrack.com.au. Client ID BB 1370008 This number is unique to your account. Please refer to this in all your correspondence with us. Client name BB Lawyers Your invoice will be addressed to this firm. Email address of your accounts department accounts@bblawyers.com.au Your invoice and statement will be emailed to this address. You will be invoiced either daily, weekly, fortnightly or monthly. Please email us on Finance@infotrack.com.au if you would like to change this. Your invoice will be emailed to your accounts email address. The last page details the payments made to the invoice and the total outstanding balance. Your payment terms are located at the top of the invoice. Please note, your account will be placed on hold if we don’t receive your payment within the payment term. A statement will be emailed to you monthly and after we receive a payment from you. Please note that when we send you a statement, we are doing so to advise you of a new outstanding balance or reminding you of invoices that are about to become overdue. The statement will list the outstanding invoices and their balance. You can download a copy of the individual tax invoice from this statement by double-clicking on the invoice number which should be blue and underlined. Simply click the "Pay Now" button to pay invoices. Choose how much you pay by editing the payment amount. Pay with any credit card. Please note that payments made this way will be subject to a surcharge. 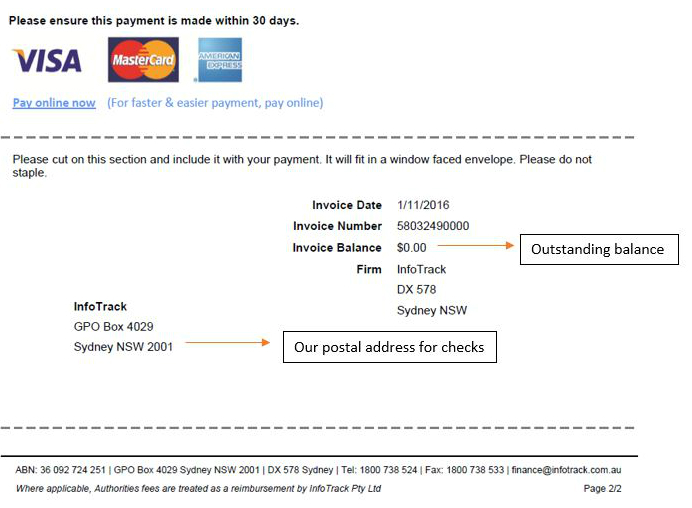 Alternatively, you can email us at finance@infotrack.com.au to set up direct debit on your credit card and you will automatically be charged as the invoice is raised and you will be sent a paid copy of the invoice as a receipt. Most payments will not induce a surcharge, however some exclusions apply. You can transfer money to our Commonwealth Bank account, either electronically or from any bank branch. These details appear on the last page of any of our tax invoices however please contact our finance department if you are unable to locate these. Please ensure that you include your client ID in the description section of the transfer. This number is unique to your account and will ensure that the money is quickly and accurately allocated to your account. If your bank does not give you the option to add text to the description of your deposit which is common if you were to deposit a cheque to our account at a bank branch, please send us a copy of the remittance advise to finance@infotrack.com.au. Please cut the section on the last page of the invoice out and include it with your cheques so that we can ensure your payment is allocated correctly. Why can’t I see my accounts section? You need to be an Admin in order to Access your Accounts Section. You can give a user Admin Access by logging in as an Admin user, clicking on your username, going to edit details and then the users tab. From here you can add users and give them admin privileges. Alternatively you can send an email to helpdesk@infotrack.com.au from an email address under an Admin user. 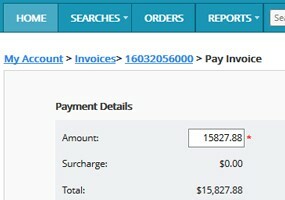 How do I change My Business Name on my Account/ Invoices? You will need to email our finance team at finance@infotrack.com.au the request to change your account name. They will send you change of account detail documents to fill out and return. How can I access my invoices and statements online? You can view, download and print your InfoTrack paid and outstanding invoices as required under My Account, Invoices. How can I review payments and refunds? Payments and refunds are located under the "Payments & Refunds" tab under My Account.